Jews Don’t Need to Convert to Jesus…The Pope Knows Best! When it comes to Judeo/Christian relations, the Catholic Church carries centuries of baggage from anti-Judaism to anti-Semitism to anti-Zionism. At the Council of Nicaea in 325 CE, the Catholic Church was officially propelled onto the world scene and continued to widen a theological gap between Christians and Jews. A gap that would also become political, sociological and geographical until it came to its apex in the 1930s and 40s when it was given a pseudo-racial twist. Let’s face it, in the Jewish psyche, the Catholic Church is responsible for a lot of anti-Semitism, but be that as it may, not all Catholics are anti-Semites. This is not a witch hunt against Catholics, yet it must be said that most of the Jewish persecution by the early Church and through the Middle Ages was performed by Catholic leaders who were also the representative of Christianity and technically of Christ on earth. The Crusades, the Blood Libel, the Host desecrations, the Black Plague, the Inquisition, the Pogroms and the Holocaust are all intertwined in a web of deceit that eventually leads back to the Catholic Church on way or another. Much of this was initiated by the Church and progressively picked-up throughout history to become lethal to the Jews as best explained by Holocaust historian Raul Hilberg in The Destruction of the European Jews. He saw the fate of the Jewish people as a three-step process over time: “From the 4th century the Christian missionaries told the Jews ‘you may not live among us as Jews’. The secular governments who followed them from the late middle-aged decided ‘you may not live among us’ and de Nazis finely decreed ‘you may not live’. Hillberg spoke of ostracism followed by expulsion and annihilation. In a nutshell, this is the history of my people. Additionally, the Catholic Church has long felt that they had replaced ethnic Israel in the plan of God. All the blessings that God had promised to bestow upon Israel would apparently be transferred to the Catholic Church or even to all Christians to speak more broadly. All Covenants made between God and the Jewish people would now apply to the “New Israel” or spiritual Israel. This is commonly known as Replacement Theology, and this also cannot be substantiated by Scripture as long as you apply a consistent, literal and contextual system of interpretation. 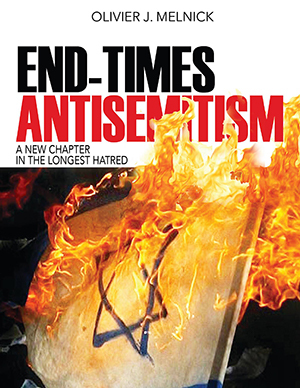 It is true that the Jewish people could easily do away with centuries of Christian anti-Semitism. Unfortunately, Jewish history has been recorded in blood for the most part. That history is part of the Christian baggage that cannot be unloaded. It would behoove Christians to stop believing what they have heard about the Jewish people and not add to this already overwhelmingly heavy baggage. To that end, the 1965 Declaration of Nostra Aetate might have helped somewhat, and the current papacy might even contribute further, unfortunately the roots of anti-Semitism–Christian or not–go very, very deep! It is also true that the Jewish people have not been replaced by Catholics, Christians or any other people group who might consider themselves the “New Israel.” That rejection of Replacement Theology was made clear in the declaration of 1965. It might not have been adopted by Catholics the world over, but it remains an “Ex Cathedra” statement by the Pope, and as such should leave no option but obedience to it by Catholics worldwide. Human nature often gets in the way, I am afraid! And of course, it is of the utmost importance to stop trying to “convert” Jews to Christianity. But is it possible that the reason for such a change is different that what the Pope would expect. Simply put, Jews don’t convert because they have no need to convert. If indeed, Yeshua is the Jewish Messiah (Isaiah 52:13-53-12) then there is nothing more natural for a Jewish person than to follow their Jewish Messiah. It is a personal choice that nobody can force us to make. So in a sense, the Pope is right, Jews do not ever need to convert to Yeshua, yet if it turns out that He [Yeshua] is the Jewish Messiah spoken of by the Jewish Prophets (Gen. 49:10, Isa. 7:14; 9:6-7, Mic. 5:2), then maybe it would benefit the Jewish people to follow Him. The Relentless Pressure of Palestinian Opportunism! We are approaching the time of the year when the United Nations meet in New York at the end of September. This year, the General Assembly will meet from Sept 28-Oct 6. As in previous years, the Palestinian Authority will do anything in their power to push for recognition by the United Nations. Considering the plethora of resolutions against Israel–being accused of crimes against humanity towards the Palestinians–the vote should be a no brainer, right? While it hasn’t happened yet, international recognition of Palestine is closer than ever before. Palestinian opportunism has a lot to do with that. But why are we closer in 2015 than we were in 2014? For this we have to review how much has happened since the last United Nations General Assembly of September 2014. Palestine currently holds a seat at the UN with a “non-member permanent observer” status. Sweden was the first Western European country to officially recognize the State of Palestine in October of 2014. They joined the only two other EU countries that already had made that move; Malta and Cyprus. It is interesting to note that Sweden’s move took place only a few months after the end of the 2014 Gaza War, at a time that common sense should have dictated the opposite. Sweden has long been know for its near all inclusive tolerance of immigrants. This has of course not alleviated the current danger of extreme Islamism in the country. There are currently 136 countries that have recognized Palestine, but each attempt at a UN vote has been vetoed by the United States. Today, only the United States, Canada, Mexico, Australia, New Zealand and most of Europe are still resisting recognizing Palestine, although most of them would follow the United States if they chose to vote yes at the UN. On April 1, 2015 (no joke here), the Palestinian Authority became an official member of the International Criminal Court (ICC) in La Hague, Netherlands. They [The Palestinian Authority] expect the ICC to investigate Israeli war crimes during the 2014 Gaza War. If the ICC does its job ethically, this is a move that could eventually backfire for the PA.
Of course, the Vatican also made the news as they joined Sweden when a treaty was signed between the Palestinian Authority and the Vatican in June of 2015 leading the Holy See to officially recognized Palestine. The treaty took fifteen years and three popes to be ratified, but it is now official. So much so that the current pope used the expression “angel of peace” in a conversation about Mahmoud Abbas. Additionally, France has been working very hard for a while, preparing a draft for a UN resolution to be passed this coming September. The same France whose Prime Minister Manuel Valls said after the January 2015 terrorist attack that “France without Jews is not France”, seems very interested in throwing Israel under the bus. If one was to look at the level of anti-Semitism in France alone, the push for the recognition of Palestine would come as no surprise. So now, the PA is again on the threshold of pushing for a United Nation recognition. Yet, in their neverending opportunism, they have come-up with one more ploy to force the UN into compliance. This one involves the raising and flying of two flags. This seems so insignificant, yet I think it is devious at best. Around the time of the United Nation Assembly, Pope Francis is scheduled to make his first visit to America. There are only two “entities” that have the status of a “non-member permanent observer” at the UN; the Vatican and the Palestinian Authority. The latter has chosen to make a clear statement by requesting that both flags be raised and flown at the time of the pope’s visit. I doubt that the pairing of the flags have anything to do with respect for the pope or Catholicism. Instead, the Palestinian Authority decided to “piggy back” on the pope’s visit to make it very difficult to say no to one and yes to the other or even worse, no to both and offend the pontiff. It would appear that yes to both is the only outcome possible. Time will tell. This might not appear to be a major political move, yet it is just one more small step towards a (not so) forced recognition of the Palestinian State by the world. Frankly the more dangerous aspect of this year’s attempt at recognition is the French push. It includes a proposal for a divided Jerusalem capital and Israel boundaries going back to pre-1967. If Mr. Obama chooses to back France on their proposed resolution, most if not all of the rest of the non-supporting countries would change sides. This would give instant validation to a group of people run mostly by terrorists and funded by anti-Semitic, anti-American states like Iran. Not to mention the fact that it would squish Israel further into the current Middle East vise– its aim being the complete eradication of the Jewish State. We are only a few weeks away and there is still time to pray for a reversal of the Iran deal as well as again, a veto on the Palestinian State recognition by the UN. In the meantime, I cannot help but remember God’s promise that He would punish all those who go after Israel. America might not be in the Bible by name but it is clearly in the Bible by deeds. Punishment awaits those who turn their back on Israel (Genesis 12:3, Joel 3:2, Zechariah 12:9). The Pope who loved the Jews…Really? It doesn’t matter if you are Catholic or not, the Pope is an international figure that cannot be ignored. As a Jew, I do not fall under his authority like a Roman Catholic would, but I understand that he can be a very influential person. Over the centuries, many popes have come and gone and those who truly loved the Jews were definitely few and far in between. I do not want to give the impression of being anti-Catholic, yet if history is our witness, the Catholic Church has often failed in the area of Judeo-Christian relations. Where the Church as a religious institution has failed, many catholic individuals succeeded, as there are many stories of Catholics loving, helping, hiding and protecting Jews over the centuries and especially during the Holocaust era. 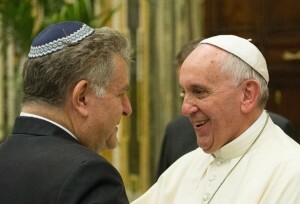 The current Pope was introduced to the world as a “friend of the Jews”. He comes only a short fifty years after Vatican II and the famous Nostra Aetate document also known as the “Declaration on the Relation of the Church to Non-Christian Religions.” This short, very ecumenical document was aimed at reconciling Jews, Muslims and Christians among other things. It is at that time, almost 1,700 years after the death of Yeshua (Jesus) that the Catholic Church decided to exonerate the Jews from the charge of deicide (the killing of God). That statement is worth reviewing: “Even though the Jewish authorities and those who followed their lead pressed for the death of Christ (cf. John 19:6), neither all Jews indiscriminately at that time, nor Jews today, can be charged with the crimes committed during his passion. lt is true that the Church is the new people of God, yet the Jews should not be spoken of as rejected or accursed as if this followed from holy Scripture. Consequently, all must take care, lest in catechizing or in preaching the Word of God, they teach anything which is not in accord with the truth of the Gospel message or the spirit of Christ. There is no doubt that a clear attempt was made at exonerating the Jewish people from the death of Yeshua. But outside of a few within the leadership of the time along with a few of their Jewish followers, the corporate guilt for the death of Yeshua was established on a false premise. A simple review of chapter 10 of the Gospel of John would probably have sufficed to see that Yeshua claimed to have given His own life for all. One doesn’t need to adhere to the Christian faith to even see that: “For this reason the Father loves Me, because I lay down My life so that I may take it again. No one has taken it away from Me, but I lay it down on My own initiative. I have authority to lay it down, and I have authority to take it up again. This commandment I received from My Father”. Interestingly enough, within the same breath, that statement declares that “lt is true that the Church is the new people of God.” Such a theological construct is also based on a faulty biblical approach seeing Christians has having “replaced” Israel. Replacement Theology has always been very prevalent within the Catholic Church. Fifty years and a few popes later, the Catholic Church has a new pontiff in Pope Francis, a Jesuit from Argentina. He has the reputation of having nurtured some very positive relationship with the Jewish community of Buenos Aires over the years. He even co-wrote the book On Heaven and Earth with Argentine rabbi Abraham Skorka. 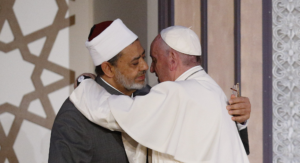 Pope Francis’ relationship with the Jewish community seems sincere and has garnered him a trust from rabbis and Jewish leaders that had not been seen in decades. So it’s all good, right? Well maybe not! Ecumenism by nature is open to a wide array of various belief systems. It seeks a common denominator on which it can build its multicultural, multi-religious and tolerant agenda. But the Pope should be careful in his ecumenical endeavor to make our world better. While it is our corporate responsibility to do all we can to improve our world–a concept found in Judaism as well, and known as tikkun olam (repairing the world)–it shouldn’t be done at anybody’s expense but to everybody’s benefit. Lately I would posit that the Vatican’s approach to the betterment of the world could end-up being very detrimental to Israel and the Jews. 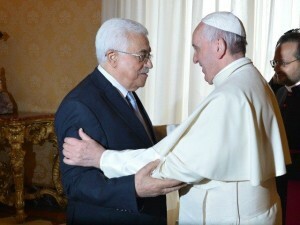 The world reacted when Pope Francis was quoted saying to Mahmoud Abbas that he was “an angel of peace”. The media outlets were quick to react, the ADL was outraged and the blogosphere buzzed with negative excitement. How could a friend of the Jews call a terrorist an angel of peace? Was the Pope an anti-Semite after all? Many would have easily taken that road, but soon after the statement was published, an explanation followed. The Pope had simply given Abbas a medal that he had also given to other world leaders, telling the head of the Palestinian authority that he hoped that he could become an angel of peace. So calm was restored and the Pope had retained his good reputation with the Jews. I have to admit that calling Abbas an angel of peace would have been a grave mistake. This being said, is it truly better now that we understand that Pope Francis was encouraging a terrorist who clearly wants the total destruction of Israel? I think not! 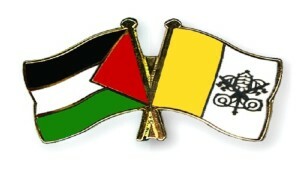 To remove all doubt, the Vatican also decided a few weeks ago to sign a new treaty to recognize the Palestinian State. The Vatican has been in favor of the recognition of Palestine since 2012, but this upcoming treaty would “formally recognize Palestine”. This will be a blow to Israel and the Jewish people, but it will also hurt the reputation that the Catholic Church has been working hard at changing at least for the last five decades. How can a friend of the Jews mingle with a terrorist and officially recognize a terrorist state bent on eradicating the Jewish people? Many Jewish people worldwide do not trust the Catholic Church and/or catholic people. While many Catholics were friendly to Jews, like the family of peasants who hid my mother and her cousins during the Holocaust years, they weren’t the norm. Looking at history, words like forced baptisms, forced conversions, Crusades, Inquisition, Pogroms and Holocaust come to mind when a Jewish person is asked about the Catholic Church. While I recognize that even using these words to describe the Catholic Church represents painting with very broad strokes, the connection is real, it is painful and in many cases the wounds are still open. Pope Francis recent dealings with Abbas and decision to officially recognize Palestine could very well destroy five decades of Judeo-catholic rapprochement and even ad some salt to these wounds. Catholics are part of what is known as Christendom and as such are considered Christians. Next time one of your Jewish friends tells you that ALL Christians are anti-Semitic, even though that isn’t a true statement, the opposite might be a bit more difficult to defend.